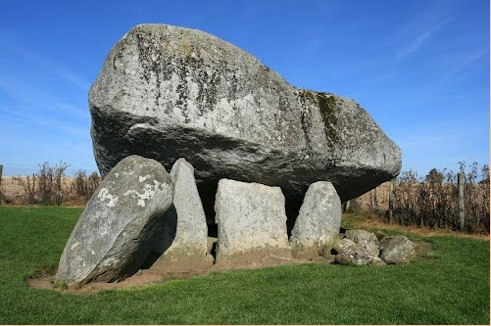 The Brownshill Dolmen is a megalithic portal tomb situated, in County Carlow, Ireland. The capstone at Brownshill, weighing an estimated 100 metric tons, is reputed to be the heaviest in Europe. The tomb is listed as a National Monument. It was built between 4000 and 3000 BC by some of the earliest farmers to inhabit the island. There are 180 of these Portal Dolmens (From the French meaning Table) mostly in the Northern part of the Island and are built just after the period of Newgrange (see our 9000 Years Historical County Meath Day Tour) It is also known as Brownshill Portal Tomb, so-called because the entrance to the burial chamber was flanked by two large upright stones supporting the granite capstone, or roof, of the chamber. The capstone is thought to have been covered by an earthen mound and a gate stone blocked the entrance.